If your question is not answered on this page, we invite you to call us at (707) 283-0300 (9AM to 5PM PST) or email us. This really is the most commonly asked question from customers from coast to coast. 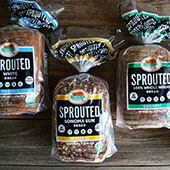 Our sprouted grain breads, bagels, buns, squares, and tortillas are truly unique in that they are made with "Sprouted Whole Wheat" as opposed to only flour. Most bakeries get up in the morning, open up a bag of flour and make something. At Alvarado Street Bakery, our process is quite a bit different. 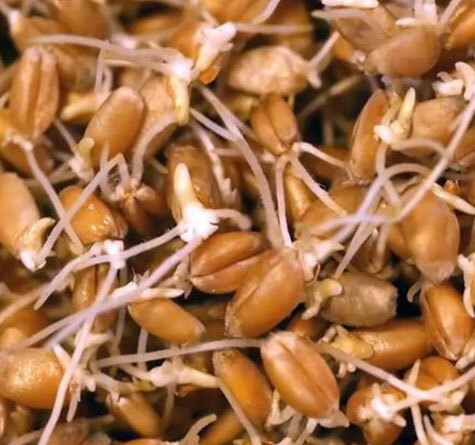 We take whole, organic wheat berries and soak them in filtered water until they "sprout", until they actually begin to grow. When the excess water has been drained, we grind the "living sprouts" into dough. What comes out of our grinder is not a dry powder, but a wet and mushy dough that becomes the basis for all of our recipes. Add a little fresh yeast, some sea salt and a bit of sweetness (natural honey, organic raisins, organic dates, pure barley malt) and there you have it, the ultimate whole grain bread! The sprouting process naturally converts starchy grains into easily digested maltose and other complex sugars. There is enzyme activity created during germination that begins to "pre-digest" the grains, thereby making the grains and their nutrients and vitamins more readily assimilated by the body. The concept of baking bread with sprouted grains is not a new idea. In fact, it dates back to biblical times when sprouted spelt (what we now know as wheat) was combined with sprouted lentil beans and sprouted soybeans. The addition of the sprouted legumes provided the essential amino acids necessary for a complete protein. This mixture was then crushed, formed into ovals and slow-baked. Centuries later, our recipe is basically the same. NO! All of the ingredients that Alvarado Street Bakery uses are certified non-GMO. We are in support of the growing movement here in the United States that wants the Federal government to insist that foods containing genetically modified organisms (GMOs) be clearly labeled. Many people in the world today have unpleasant reactions to wheat or have difficulty assimilating products made from wheat flour. During the process of sprouting wheat, there is an enzyme created that begins to "pre-digest" the wheat, and many people have been found to be more tolerant of sprouted wheat products than of those produced from wheat flour alone. Our products are NOT gluten-free (they are all made from sprouted wheat) and are not suitable for individuals with celiac disease. Other allergens that may be present include: Corn, Sesame and Soybeans. Does your bakery use peanuts, tree nuts, dairy or eggs? No. 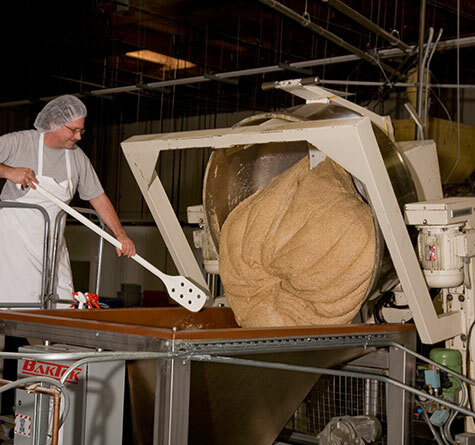 Allergens that are NEVER used in our bakery include: Peanuts, Tree Nuts, Eggs & Dairy. At Alvarado Street Bakery we never use chemical preservatives or additives of any kind, no bromides, nothing artificial. This natural approach leaves our products with a very short life. 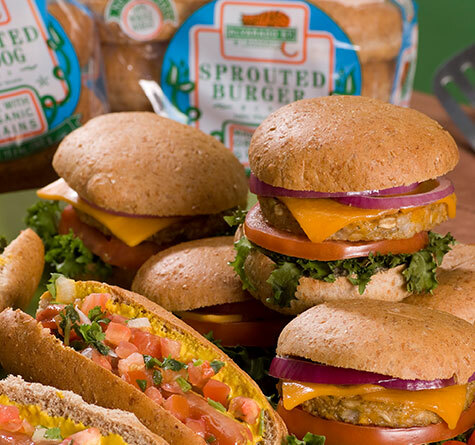 Whereas most breads don¹t freeze well, becoming dry and tasteless, our sprouted products do exceptionally well when stored frozen. This has enabled us to offer our products to customers throughout the country, and even internationally, who simply thaw and enjoy. The result is a light textured, whole grain sprouted wheat bread that is both nutritious and delicious... the Ultimate Bread! 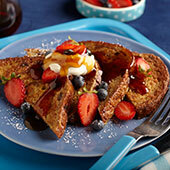 Do you have breads that are low in carbohydrates? 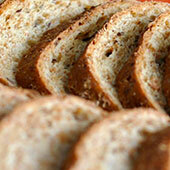 Our Sprouted Flax Seed Bread offers only 9 grams of carbohydrates per slice (8 net). Due to the sprouting process and our limited use of natural sweeteners many of our breads contain significantly less carbohydrates than traditional breads made with flour. 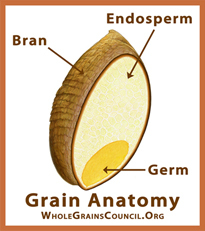 At Alvarado Street Bakery, we’ve always emphasized the importance of whole grains and the right carbs! The Whole Grains in our Sprouted Breads are "Complex Carbs"… not the simple carbs and simple sugars we should all strive to avoid. The benefits of whole grains and complex carbs in a healthy diet have long been established. Every body needs carbohydrates… make sure you choose the right carbs! Do you make a biblical or Ezekiel-style Bread? Our Sprouted California Style Bread contains the essential ingredients as listed in Ezekiel Verse 4:9 in the Old Testament. Can I order your bread directly from you? All of our products are available for purchase through our web site. Due to the fact that we do not use any preservatives, we ship using only FedEx Overnight, 2 day and 3 day shipping options. We do not add any additional costs to the FedEx shipping rates. 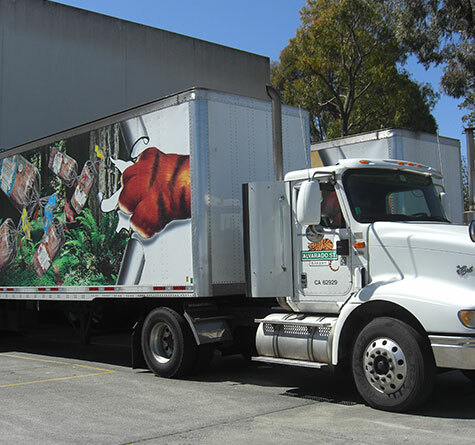 Many customers find the FedEx shipping costs to be cost prohibitive, and it is almost always more cost effective to purchase our products at your local grocery or natural foods store. If we are not in your local store, please request us! To find a store in your area, please use our product finder! Why are you called Alvarado Street Bakery when you are not on Alvarado Street? When we were thinking on a name to call the bakery we ran a "name the bakery" contest in the local community. But as we sat there pondering a choice someone said, "Hey, why not Alvarado Street Bakery just like the sign sitting on top of the ingredient bags?" (an Alvarado Street sign from Los Angeles had found its way into the bakery from a slight fender bender done by a co-worker). The name resonated and we knew that this was the name for us. The original Alvarado Street sign still remains in our bakery as a talisman of our good fortune. Alvarado Street Bakery products are available throughout the country, and even internationally. We can be found in most natural food stores & health food markets as well as many major supermarkets throughout the country. If your favorite local market isn’t carrying our breads… please ask them to contact us and we’ll work with them to get our products into their stores. Please use our PRODUCT FINDER to find a store near you. Is there a story behind the cat on the sign? Back in the days of yore, we had a bakery cat that lived in and around the bakery. Her name was Greta and she was part of our hippie organic pest management program (we have changed and improved tremendously over the years and are very proud of our current food safety/hygiene program!). 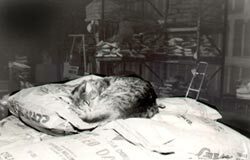 Greta used to sleep on the bags of ingredients right below the Alvarado Street sign. She lived a full life and is now immortalized on all of our packaging.